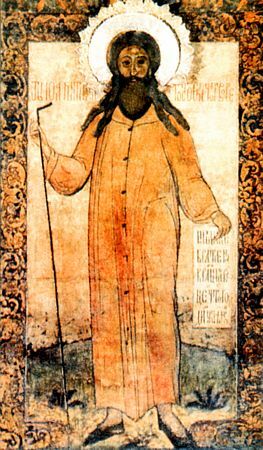 Blessed John the Merciful of Rostov (also known as "Vlasatyi" – "the Hairy") asceticised at Rostov in the exploit of holy folly (iurodstvo), in it enduring deprivation and sorrow. He did not have a permanent shelter and at times took his rest at the house of his spiritual father – a priest at the church of the All-Holy ("Veskhsvyatsk"), or with one of the aged widows. Living in humility, patience and unceasing prayer, he spiritually nourished many a person, in which number was also the Monk Irinarkh, Hermit of Rostov (Comm. 13 January). After his lengthy life of pursuing asceticism he died on 3 September 1580 and was buried, according to his final wishes, alongside the church of Saint Blaise beyond the altar. He had "hair upon his head abundantly", wherefore he was called "Vlasatyi" or "Hairy". The title "Merciful" was bestown upon Blessed John for the many healings that occurred at his grave, and also in connection with the memory of the holy Patriarch John the Merciful (VII Century, Comm. 12 November), whose name he had in common.